I feel like Jyrkka should be the one to elaborate as it is his signature. However my thoughts, it's a brain twister to be sure! "I don't know half of you half as well as I should like..."
He does not know 50% of the Hobbits as well/much as he would like to. There are fewer than 50% of the hobbits that he feels he does not like as much as they deserve. and the small amount of people that he does like, deserved to be liked (or treated) better than he did. anyway... that's what I got out of it.... in other words... he should have gotten to know them all better and treated them better while he was there with them... Yes? Vickster and Rara have it. I always felt that he was saying "I've been a reclusive guy since I got back, and there are many of you here I would have liked to have known better. Then there are the rest of you, many of whom I did NOT invite (like the Sackville crew), who I've been smiling at and waving 'hello' to for years, and most of you bastards didn't even deserve that." Agreed on both counts, but I love the way you put it, nightshade. A closed mind is like a closed book - nothing can be gained if either remains closed. Where is Jyrkkä Jätkä in this topic? I would love to know your reasons for having it as your signature and its meaning to you. I take it more as a backhanded insult to many of his guests. The second half of the saying, I interpret as, "Those of you that I do know, I don't really like." But he spins it by saying that he doesn't like them "half as well as they deserve," meaning he should like them more than he does, but he just doesn't. The first half is a bit nicer "I don't know half of you half as well as I should like." He's saying, "I recognize that many of the people here are worth knowing, but unfortunately, I haven't had a chance to get to know you well and develop a fondness for you." Even this is insulting, because in all of his years, what was stopping him from getting to know them? He didn't feel it was important enough to make that effort. Then again, if he did get to know them, he probably wouldn't like them anyway, given his proclivity to dislike people more than they deserve. Overall, this is one of the most clever lines in all of literature. Either way... I LOVE LOVE LOVE these books... The Hobbit & Lord of the Ring Trilogy!!! I have read Hobbit, Lord of the Rings and Silmarillion - don't know how many times. Nowadays merely because of Tolkien's language. MichalG is right, this is one of the cleverest polite insults written. enkä pidä puolistakaan niin paljon kuin ansaitsisitte." I remember reading Bilbo's speech several times before I understood its full meaning. you guys are all probably right. But if I may add another perspective. He is saying nothing because the two statements cancel each other out? It's Bilbo's birthday on Saturday - or is it next Sunday? It's very difficult since Pope Gregory stole those ten days out of the calendar! and i like less than half of you (Hobbits) half as well as you deserve (to be liked)."? It's easier if you think of real numbers. Let's say there are 100 Hobbits living in Hobbiton. Bilbo knows 50 of them less than he wishes he did. There's only one of him, and it takes time to get to know someone well! He knows and likes those 50 people, he just wishes he knew them better, but there just isn't enough him or time to! Unlike the next set of folks, he likes them as much as they deserve, but he wishes he _knew_ them better! 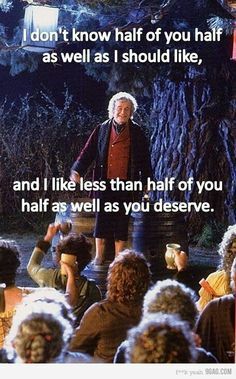 Next, there are, let us say, 45 other Hobbits, that's less than half, and he knows them, and likes them, but he feels that he likes them less than he feels they deserve. I've always thought if he'd had enough time, he would have gotten to know and like them better. Again, one him, limited time. My guess is he likes everyone to some extent, except for the Sackville Bagginses. Anyway, that's my take. I've been reading these books for 40+ years! "There are only ten kinds of people in the world (perhaps a reference to un-attainable human perfection ? ), ... namely, those who understand binary logic versus those who do not." Prattling along with empty talk, playing around with words, but actually saying nothing. Some politicians make a living at it. Especially the speeches telling what is going to be done about the recent ______________ crisis. He acknowledges a less than ideal relationship with half of the attendants. He then states that less than half of his audience has a case against him, in terms of him liking them better. Tricky and fun wordplay, but ultimately manageable. No one could claim to be directly insulted, despite the initial impressions one might feel upon hearing/reading it. "I don't know half of you half as well as I SHOULD like"... No one really mentioned the 'should' when explaining his words, but in how I see it, that word is pretty important? He states that Hobbit norms and values describe for him to be interested in other hobbits, or at least, to feel the need to know a lot about them. He thus distantiates himself from being 'that kind' of a hobbit, suggesting the other hobbits are snobs. "I don't know half of you have as well as I should like, and I like less than half of you half as well as you deserve." I only know/like up to half of you people, and only for up to a maximum of less than half as I should like (to know/like any of you), so even those few of you that I've ended up knowing/liking as much as I have are good people and I should have tried to know/should like you even more, let alone the rest of you (that I know/like much less) who are just as good. PS: He only said that he didn't know them all as much as he should, not that he only knew some of them. He knew all of them and that's why he could name the families (Bolgers, Boffins, Proudfoots Proudfeet..). Also, one doesn't have to know a person to like them. You may like or dislike someone because of something you once heard about them, so the two sentences can be independent. But that's just what I can get from it all.. The sentence is a very mean insult, cleverly disguised. He says: "I know the lot of you pretty darn well and you fully deserve the little liking that I have for you." "I don't know half of you half as well as I should like ..."
Leave out the "don't" in the sentence and what remains is that he knows half of them not very well. But he doesn't. Meaning that he knows more than that better than that. "and I like less than half of you half as well as you deserve." Less than half of them don't get what they deserve. That may be a few less or considerably less. Maybe hardly anyone. So most of them get what they deserve. If you take into account what was said about all the Hobbits a little earlier in the book, it is quite clear that Bilbo has a pretty good idea about the dumbness, deviousness and greed of most other Hobbits and that his character assessment is a good enough reason for him to not like many of his fellow Hobbits a great deal. A similar quote, by Owen Barfield: "We must not forget, that nine-tenths of the words comprising the vocabulary of a civilized nation are never used by at most one tenth of the population; while of the remaining tithe, nine-tenths of those who use them are commonly aware of about one tenth of their meanings." Barfield was a friend, and fellow Inkling, of Tolkien. Let me think about that one . . .
c) People he knows and treats them exactly the way they deserve, which again, could be for better or worse. If there are 100 hobbits 50 of them are people he would have liked to have known more. Group A. Then you have a variable, 1 - 49. Group B. <-- you can't have fractions of hobbits this early in the book. Of those hobbits, in his estimation, the number of hobbits in group b have not been treated as well as they deserve. For better or worse. Some number of those members of group b 1-40 are people who he thinks have wronged him and he should have put more energy into treating them as poorly as he was treated. While the other members of group b treated him kindly but he didn't put as much effort into making them friends. The last set are people who get exactly what the deserve. In our example that would be 10 hobbits. Let's say of that group 5 are people he knows very well and likes them and treats them like friends. The other 5 are people he knows very well, dislikes them, and treats them the way he means to. All in all the only thing he says for certain is that he didn't get to know half of them as well as he might have liked. The rest is this vague math with more variables then answers and leaves it for his audience (the hobbits in attendance) to figure out which category they fit into. The only clue the audience has is context. He starts by saying that 111 years was to short a time to live among such admirable and noble hobbits. Clearly stating that he has a positive opinion of the majority of them. So there are probably more people in the b and c group that he would count as friends or would have liked to have treated better. In summary I would have liked to have known more of you because I believe the lot of you are for the most part fine characters. Some of you I have not treated with the respect or admonition that I should have, and the rest of you, you know that I either care for you or despise you because I have treated you exactly the way I meant to. There are 3 groups of people . . .
Now, I haven't forgotten Owen Barfield's quote about words - perhaps we need the same logical approach . . .